Wayne Gault, who has complained to the advertising standards agency regarding adverts promoting health benefits of Scottish Gin. Picture by Scott Baxter. The Scottish Gin Society has been criticised for falsely advertising the drink as having health benefits and “linking alcohol with sexual success”. The Aberdeenshire Alcohol and Drug Partnership reported the promotional body to the Advertising Standards Agency (ASA) over a string of internet posts. One of the messages suggested that drinking gin was more healthy than eating a banana, while another claimed the spirit had been encouraging women to sleep around “since the 1600s”. One post suggested people should forsake a month-long abstinence drive known as “dry January” in favour of enjoying “Ginuary” instead. Others boasted that gin has “never-ending medicinal properties” while one indicated that people should “only drink gin on two occasions, when they are thirsty and when they are not thirsty”. The agency also slammed the group for posting a message which promoted the idea of gin helping to make people “look better naked”, and recommending it as an alternative to healthy eating and exercise. 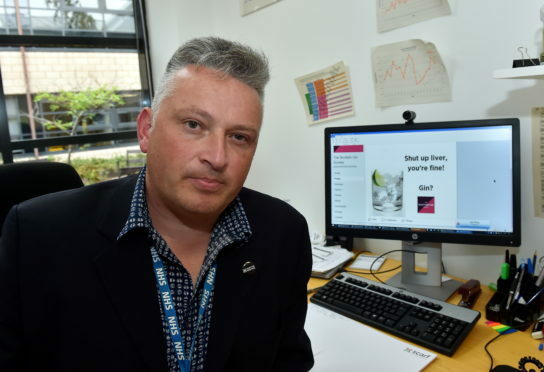 Team leader with the Aberdeenshire Alcohol and Drug Partnership, Wayne Gault, reported the posts to the ASA as part of a crusade to crack down on the “irresponsible” online marketing of booze. Mr Gault said: “There are many rules and regulations about where alcohol can be advertised, but social media is like the wild west and this complaint was an experiment to see if advertising rules could be enforced in that area. ASA told the gin group to ensure future adverts did not “encourage the excessive consumption of alcohol, or make health claims” or to “imply that alcohol could enhance attractiveness or lead to sexual success”. The Scottish Gin Society has removed the posts in question, but the non-profit outfit issued a blistering response to the sanction. A spokesman said: “This is the most po-faced, fun-free, nanny state judgement imaginable. “ASA freely admits that these posts were ‘lighthearted’ and they are not even adverts, they are re-posts of funny memes. Mr Gault, who has dedicated years of his life to helping to reduce the problem of alcoholism in Aberdeenshire, explained the severity of the area’s battle with the bottle. Mr Gault insisted that he was “not being a killjoy” by flagging concerns with the posts that the Scottish Gin Society insisted were meant to be taken in jest. He said: “Unless you have got an issue with alcohol, then these may seem harmless. “But about 7% of the population of Aberdeenshire is clinically dependent upon alcohol to the extent that they could become seriously unwell and die if they stop drinking. “There are a significant number of folk who struggle with alcohol in our community, 25% of residents drink more than the recommended amount. “The issue with the Scottish Gin Society’s posts relates to the ubiquitous nature of alcohol and its omnipresent advertising in our community. However, Mr Gault pointed out that 16% of Aberdeenshire residents are abstinent and that an increasing number of people aged from 16 to 25 are opting not to drink alcohol.